IWhy does food stick to a pans surface? Food that sticks is caused by chemical bonds that form between the food and the material of the pan - almost always a metal. These bonds may be relatively weak van der Waals forces or covalent bonds. Protein-rich foods are particularly prone to sticking because the proteins can form complexes with metal atoms, such as iron, in the pan. For a full explanation see: Why foods stick to pans? 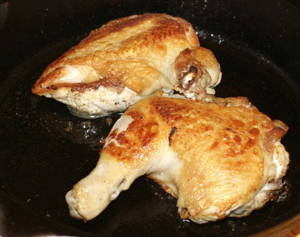 A properly seasoned cast iron pan will have a nonstick surface. The patina will be a dark shiny black surface. When oils or fats are heated in a pan, multiple degradation reactions occur, including: autoxidation, thermal oxidation, polymerization, cyclization and fission. [See wikipedia references below]. The development of a seasoned cast iron pan is actually a two part process: polymerization and carbonization. The first part involves developing a thin layer of polymerized oil on the cast iron.This is done by applying a very thin coat of unsaturated oil (e.g., canola, flaxseed or grapeseed oil) to the cast iron surface and heating it in an oven until it dries. Unsaturated fats work better since they have less hydrogen's and therefore have less non-carbon components. Once the polymerization process is complete the layer of oil cannot be easily removed. 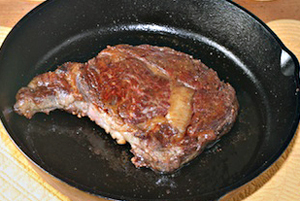 To complete the seasoning, which involves laying down of a carbon matrix on to the cast iron surface, heat must be applied slightly above above the smoke point of the oil. If you do not heat above the smoke point only the polymerized oil coat will be present instead of having an added rich black carbon matrix. Unsaturated fats work best (unsaturated means that some of the carbons in the fatty acid chains contain reactive double bonds). Nineteenth century American cooks typically used lard because it was readily available and unsaturated enough to polymerize well, but almost any oil will work. ( Note: Lard from the 19th century was more saturated than today because the feed was more natural). When an unsaturated fat is heated to high temperatures, especially in the presence of a good catalyst like iron, it is broken down and oxidized, after which it polymerizes –joins into larger mega molecules the same way plastics do – and mixes with bits of carbon and other impurities. This tough, impermeable surface adheres to the pores and crevices in the cast iron as it is forming. The surface is nonstick because it is hydrophobic – it hates water. A well seasoned cast iron pan will have a slick and glassy coating that isbest achieved by baking on multiple "very" thin coats of oil. Note 1: We find that using a very thin layer allows the best results since the patina is a two step process, polymerization and carbon deposition. If too much oil is spread on the cast iron pan you can achieve polymerization but carbon deposition will not be sufficient. Note 3: If highly unsaturated oils are used and too low a temperature they will not completely polymerize leaving a sticky layer. The problem with this sticky layer is that it is still prone to further oxidation and can therefore turn rancid. Low temperatures do not completely polymerize and break down oil and will leave a brown, somewhat sticky pan instead of a black, nonstick one. 400-500 degrees F is the effective range for seasoning. --It is a good regulator. It retains its temperature longer than other materials and won’t produce temperature spikes. -- Cast iron is slow to heat up, so it’s also slow to cool down. --cast iron is slow to heat up, and will have initial hot spots since iron is a poor conductor of heat unlike aluminum... it will also be slow to cool down. Cast iron skillets do not heat evenly on the stove top so for best results preheat the pan in the oven then cook on top. This will insure a nice even sear. In some case e.g., a rib eye steak, chicken legs or pork chops we will return to the oven to get a nice even crisp brown (see photo below). Note: I would stay away from deglazing a cast iron skillet with wine since the acid can react with iron. But it's OK to deglaze with a stock. 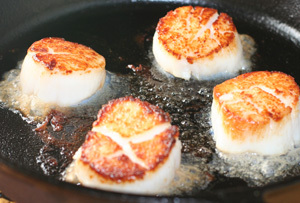 Cast Iron Cooking -- Seared Scallops in preheated hot cast iron skillet... 3 minutes on heat, flip, turn off heat and remove from hot burner. The pan is hot so it will continue to cook through. 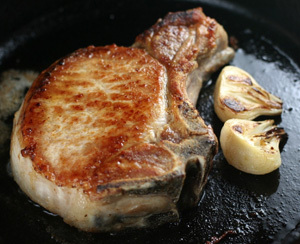 Cast Iron Cooking--his is probably one of the best ways to do a rib eye steak. Let the steak come to room temperature... salt and pepper and a little oil on both sides. Heat the skillet at 475 in the oven then bring to the stove top and heat some more (dry). Then throw it 3-5 minutes on each side and another 5 minutes in the oven. This gave a nice medium rare center after resting another 5 minutes off the skillet. This was a 1.05 lb, 1inch thick cut. You will have to play with the times using this method to get it right to your taste --- just remember to expect a 'lot' of smoke on the stove top! Cast Iron Cooking--Preheat cast iron skillet in oven 475F-- add oil and then sear skin side down for 7-10 minutes checking heat -- from high to medium -- skim off fat and move to oven for another 5 minutes leaving skin side down. Then flip over and remove fat and let cook skin side up for 2-3 minutes till done. Note: times may be different depending on type of chicken. Rinse the pan with hot water immediately after cooking. For burned-on food it's all right to scrub with a mild abrasive, like coarse salt, and a nonmetal brush. This will help preserve the nonstick surface. Some recommend for cleaning to pour some kosher salt into the pan and wipe it out with a paper towel. If the pan gets a sticky coating or develops rust it will need to be reseasoned. To prevent rust from forming dry the skillet thoroughly and lightly coat the cooking surface with cooking oil. 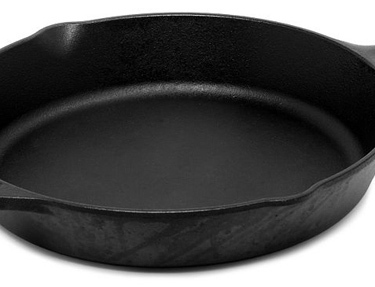 To prepare a cast iron pan for re seasoning you can put it in the oven on the self-clean cycle. It will come out like brand new, ready for seasoning. I like to keep my cast iron skillet in the oven all the time. Even when using the oven for other purposes.